nextzett Combi conserver is an innovative Hochleistungskonservierer the latest generation.Based on cationic surfactants, glossy polymers and sealing acrylates. The new silicone- and mineral-oil-free formulation enables modern, high-quality care components to achieve a micro-pearl-free drying with outstanding long-lasting acrylate preservation in all automatic car washing systems and ideal for self-service washbasins. nextzett Combi Konservierer proves its efficiency even and especially in problem systems with unfavorable water conditions. Particularly with very soft or extremely hard water a perfect drying and preservation is possible. The spontaneous, large-area elevation reduces microbe formation in hard water. nextzett Combi conserver can be used as high-end dryers, and as Schaumkonservierer Heißkonservierer. The result is a stain-free vehicle with perfect gloss preservation.Microscratches become invisible, the varnish becomes noticeably smoother. The surfaces remain clean longer, new dirt adheres significantly worse on the paint. During the next wash the dirt can be removed much easier. We call the "easy-to-clean-effect" in perfection. By eliminating silicones, the after-treatment of the vehicle windows becomes superfluous. nextzett Combi Konservierer is pressure applied to the washed vehicle. When using as a heat preserver, use warm water (up to a maximum of 40 ° C); The order is also printed without pressure. After 2-4 sec the water relaxes and the surface of the water ruptures spontaneously and large area. The water beads do not stick to the paint surface, but are removed by the blower without the formation of microbeads. Even with problem systems with short bubbling, a high belt speed or low fan power is Konservierer nextzett Combi perfectly usable. The enormous preservative efficacy with visibly more shine under eliminating manual post-treatment of the discs makes nextzett Combi Konservierer a universal product for preservation, as high-end dryers, foam wax or hot wax. Nextzett Combi conserver is a highly concentrated and therefore very economical to use. 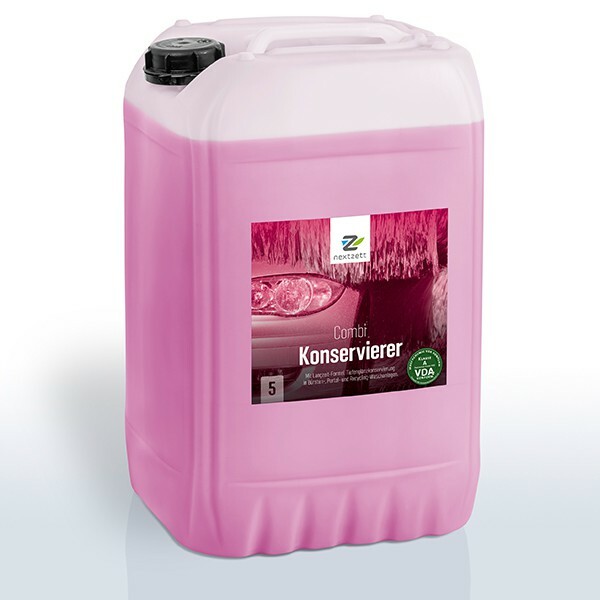 The consumption is normally dependent on the washing system between 8 and maximum 15 ml per vehicle. Before filling nextzett Combi Preservers, rinse existing storage containers. Shampo rests or residues of other drying aids must not be present. The application should be pure. For dosing pumps, set 8-15 ml per car.